In 1945, when Joe and Stella Sobchik opened a small café on Fremont Street in Las Vegas, the war was still on, and that meant rationing. Running a restaurant was a challenge in those days, but Joe and Stella stuck it out and Virginia’s Café (named for Stella’s mom) did pretty well for a few years. 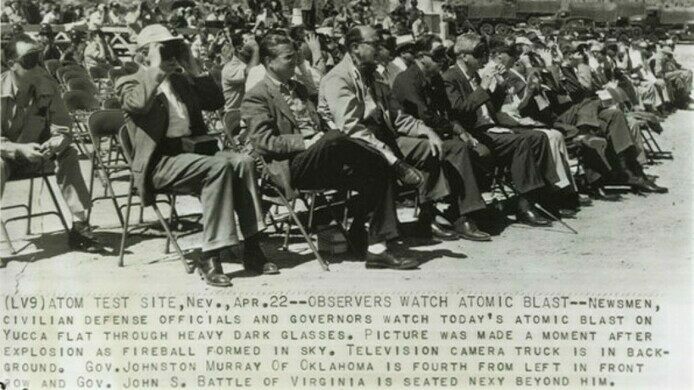 In the early 1950s Vegas was booming, and at the nearby Nevada Test Site for nuclear devices, so were mushroom clouds. 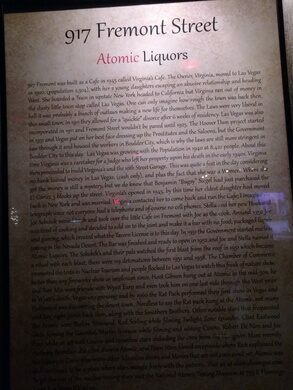 Joe had grown tired of flipping burgers and saw an opportunity in catering to the liquor needs of Fremont Street, so with atom bombs literally and figuratively in the air, in 1952 the Sobchik’s shut down the café and opened Atomic Liquors. 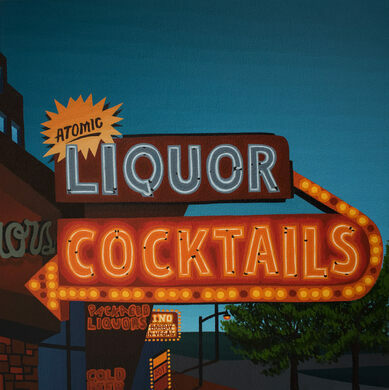 They lit up the now-famous neon, got themselves the very first Las Vegas Tavern License, and were on the road to becoming the oldest free-standing bar in town. 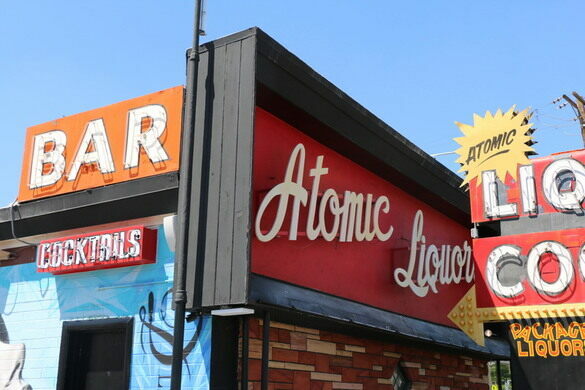 At first Atomic Liquors was just a package store, selling beer, wine and the hard stuff on a take-out basis. But with the newly-minted tavern license, mix drinks could be served alongside the stuff going out the door in paper bags, and it became a 24 hour a day business. Rooftop service was added so customers could tipple a few “Atomic cocktails” while watching the blasts 65 miles to the north (it being a time before the dangers of observing nuclear testing was understood). Atomic Liquors has held down their corner of Fremont Street for over six decades, under the watchful eyes of the Sobchiks for most of that time. Joe and Stella were still in the house into their 90s, and in 2010, after they both passed away, their son Ron took over. 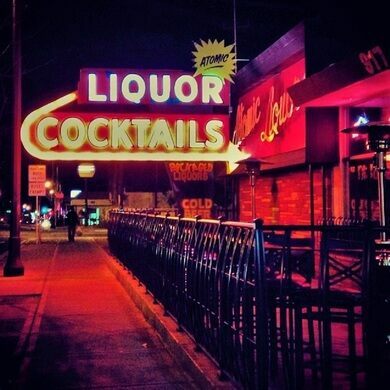 A couple of years later the family sold to new owners, looking to keep the old haunt just as it had been back in those early Rat Pack days. 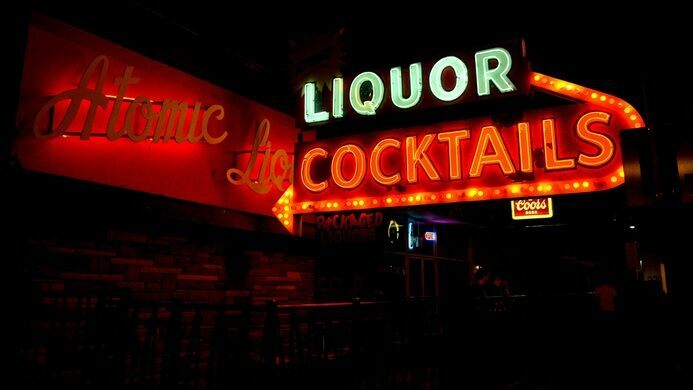 The bar was restored to its original configuration, with the famous neon kept intact. 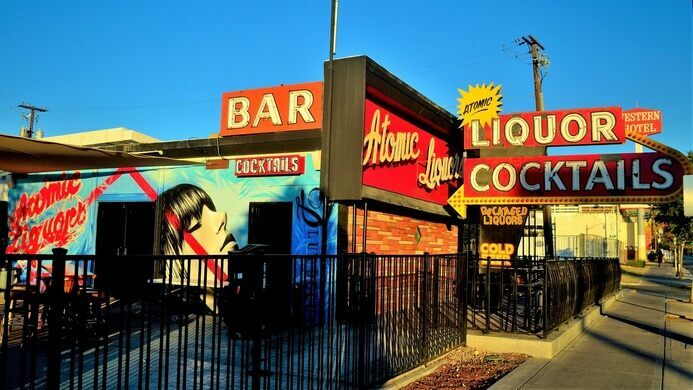 You can still order up some Atomic cocktails–just hold the mushroom clouds. 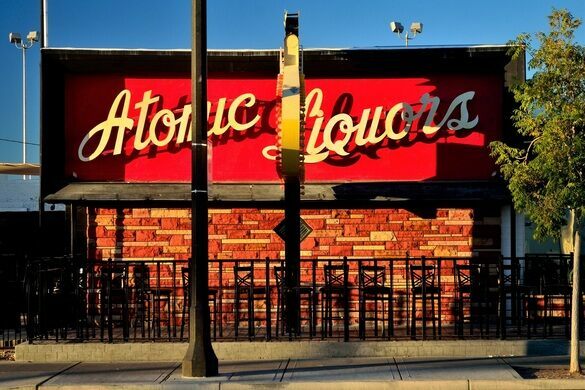 Atomic Liquors is open from 4pm to 2am on most days, and until 4am on Fridays and Saturdays. There are always special events to watch for, so check out their website for full updates. 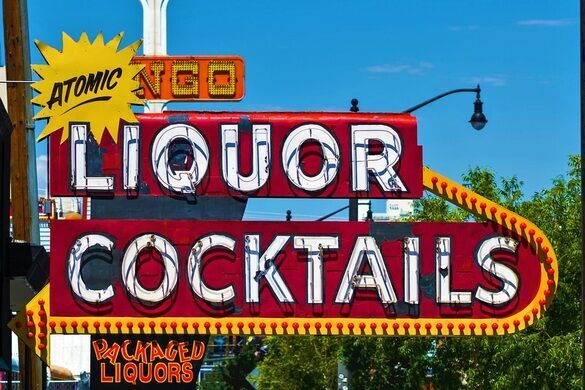 They are located on Fremont Street, just a few blocks down from the Fremont Experience. One of the Cemestos prefab homes built to secretly house thousands of Manhattan Project workers. The site of an underground detonation of a megaton nuclear bomb in the middle of the Mojave Desert. Bomb tests and sheep ranchers share the world's largest military land base.